Encourage kids to kick start their celebrations by hooting custom large horns – red! It helps them to express themselves and to attract others attention. 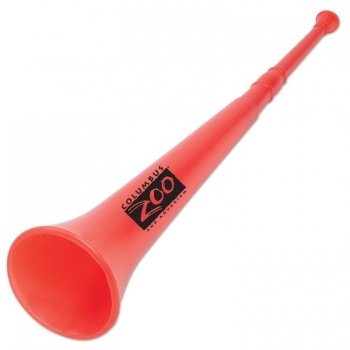 A branded promotional large horn – red can be employed for promoting a music studio, charitable art product, school fundraisers, a school football event, or to ring fun into a kid’s birthday party. It is for sure that kids who receive a personalized large horn – red are gonna retain it for long time because it’s big, enchanting and allows them to express their happiness loud. This large horn also makes a great acknowledgement gift for advertisers such as mermaid destinations, theme parks, botanical gardens, zoos, daycare, playschools, summer swimming classes, summer camps. Product Size: 28". Imprint Area: 3 1/2" X 1". Imprint Area : 3 1/2" X 1"